WASD Shift: Release Day DLC? Gaming faux pas or playtime for the privileged? With EA/Biowares recent decision to add some pretty gnarly DLC to ME3's collectors edition or available for separate purchase on the day of release, many gamers are outraged by this decision. On the release day of Mass Effect 3, downloadable content available at an extra cost or with the collectors edition (which is of course more expensive than the standard version) was made purchaseable, which includes a new squad member and new looks for all the existing members - nice features but also in the opinion of many gamers story changing features. 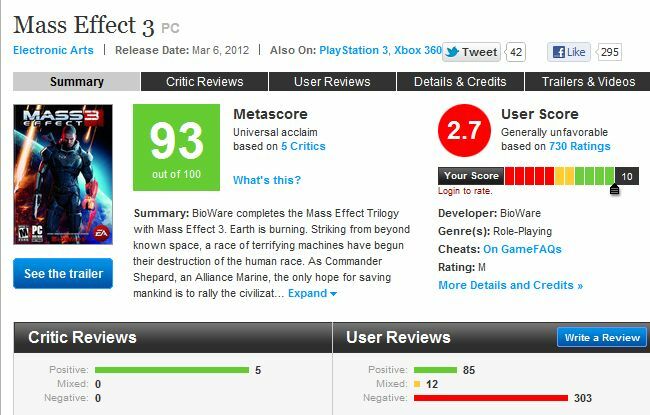 As you can see on the image the right, whilst achieving a good critical review by those in the industry, ME3 - more specifically EA/Biowaare has clearly pissed off the gaming community by pulling this stunt for more cash. And that is what it is, and had the community not been so outraged, it would have been a successful business strategy. EA knew that the gaming community that have invested in their previous ME titles would most likely opt to buy the DLC, however I don't think they expected the sheer amount of rage that has been expressed since the release of both ME3 and ME3: From Ashes DLC which has caused an outcry from many gaming critics and even resulted in many trying to boycott the game. People, myself included, expect content that is completed by the games official release date to be included in the standard game, with a couple of neat features (but nothing game changing) in the collectors edition. EA have definitely screwed up here, had they given a few months before releasing it, gamers would have been none the wiser and invested in it with no argument, but their radical plan to do it on release was just stupid and whilst they have likely made a lot of money through ME3 and the DLC, I think it's a safe bet to say that they probably didn't make anywhere near as much as they had hoped. I have to say though, I do agree with Nintendo's philosophy on DLC, they want their released games to offer the gamer 'the complete package' and that's something that many producers should think, but with the willingness of gamers to purchase DLC it seems as if you are missing a trick if you don't jump on the boat. Personally I have rarely bought DLC and most of the time it has been in an 'Ultimate Edition' bundle with the game itself.